I had been trying to amass more skirmish marks recently. I even built a spreadsheet for marks/minute, etc to know which skirmishes were the biggest bang for the time. I’ll share that data table in a future post. However, I stumbled across a post in the Casual Stroll to Mordor site ( casualstrolltomordor.com/ ) discussing something in the Lotro store called a “Scroll of Skirmish Refund”, available for 295 TP. The discussion centered on how many marks one would get back for using the Refund scroll and then re-leveling your skirmish soldier. Historically, I haven’t skirmished as much as some people. Because I am a quest-hawk, I didn’t enter a skirmish until I was level 65, then I leveled Dr. Quinn, my Herbalist, up equal to me. 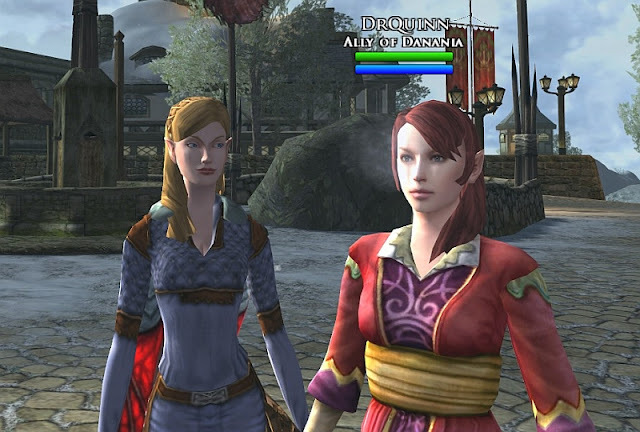 Then when Rise of Isengard was released, I quested forward to level 75, then leveled Dr. Quinn again up equal to me. Needless to say, my skirmish mark spending was about as optimized as I could have possibly made it, choosing only the traits to build a great Herbalist. However, all of this happened before one of the 4Q11/1Q12 Updates changed how much leveling a soldier should cost. 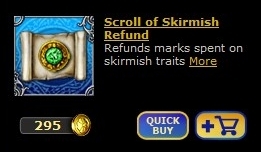 I was very skeptical, but I gave it a shot and bought a “Scroll of Skirmish Refund”. The refund gave me 38,729 marks, and turned my equivalent level 75 Herbalist back to the beginning. Now, I had to respend the marks and get her back equal to me, and hopefully it would cost less than 38k marks. Everywhere I go, I bring my herbalist Dr. Quinn. The only place we have ever been defeated while soloing is The Icy Crevasse (prior to the speculated 2012 changes to Icy Crevasse). I think that we typically underestimate it since it is a step more difficult than any other skirmish. Proportionally, The Icy Crevasse gives the best marks of any solo skirmish. That said, I have never even considered needing another soldier other than the Herbalist. As the enemy, you would have to hit faster than I can hit and Quinn can heal, and that just does not usually happen. For group skirmishing, the herbalist heals the group and is one of the best soldiers for grouping, so there is no need to switch soldier when grouping either. Ok, back to the mark reset math. So, I got back the previously-thought frugally spent 38,729 marks and was respending them. I could break down the various costs by level, but I will fast forward to the answer. Final cost = 9,571 marks to reset the herbalist as an equivalent 75 (solider level 31). Bottom line = 29,158 marks for the price of 295 TP. Now that is a very good deal. I highly recommend this purchase if you leveled your soldier to 31 before January-2012. At a rate of 210 marks per skirmish, that was equivalent to 139 skirmishes to accumulate 29k marks, and at 15 minutes per skirmish, that is about 35 hours of skirmishing (math to be accounted in another post about the excitement of skirmishing marks/minute.... UPDATE skirmish marks/minute link is fastest-skirmishes-marks-per-minute). Hooray for new blog! Also, this is a very good thing to know about. Yay! Wecome Asciel! Great to see you here. It definitely is. I had been skirmishing as heavily as I could to pay for stuff like "Greater Empowerment Scrolls" when I learned of it. I was "mark poor" at the time and now I have 30k marks for doing relatively little. 295 was a great buy. Just wanted to say hi, and that I am enjoying playing LOTRO vicariously through you. I am currently living in the world of Darth Vader and the Sith Empire. I have so many fond memories of riding our horses through the snow in Middle Earth! Take care and keep on bloggin'! Woohoo! Thanks for the comment!